In the months after Fort Sumter fell, Missouri was riven by a civil war within a civil war. 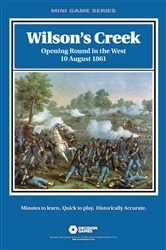 Missouri rebels, organized as the Missouri State Guard under Sterling Price, had been joined by a Confederate force under Ben McCulloch the threaten Nathaniel Lyon's small but well-drilled Union army in the southwestern part of the state. Lyon, hoping to catch the Rebels off guard, attacked their scattered camps along Wilson's Creek. The initial Union assault went well before the battle devolved into a grueling firefight. Confederate numbers eventually prevailed, but Lyon's attack might have succeeded. Wilson's Creek uses the simplified QuickPlay version of the Musket & Saber system of warfare during the muzzle-loading era. Combat is based on unit quality rather than raw numbers, and rewards use of historical tactics. All units are susceptible to rout when weakened, so players must maintain reserves. Leaders enhance unit capabilities. Winning the battle depends on deployment, thoughtful maneuver to concentrate at the key points, the proper coordination of arms, careful use of leaders and special units, and an understanding of the strengths and weaknesses of each army.